Providing the most festive procession for your wedding party! Orlando Horse and Carriage will assist in delivering the most festive and memorable procession as you arrive in style on our white Percheron horse covered in traditional hand made fabrics imported from India. We are experienced with providing wedding horses that are well trained for a festive Indian wedding. 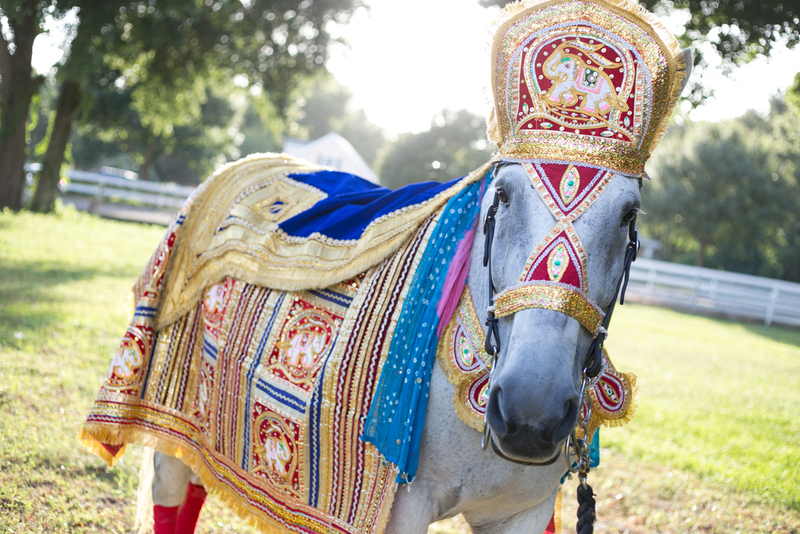 Our Indian wedding horses have participated in a number of Indian / South Asian weddings and are extremely calm and at ease around the drumming sounds of the Dhol, DJ, Bollywood band and excited Baraatis. Carriages can also be used for your Baraat and/or Vidai. Our Indian carriage includes elevated rear seating / a throne. Baraat Horse Boca Raton, Baraat Horse Coral Gables, Baraat Horse Daytona Beach, Baraat Horse Fort Lauderdale, Baraat Horse Gainesville, Baraat Horse Jacksonville, Baraat Horse Key Biscayne, Baraat Horse Kissimmee, Baraat Horse Miami, Baraat Horse Orlando, Baraat Horse Ormond Beach, Baraat Horse Palm Coast, Baraat Horse South Beach, Baraat Horse Tampa, Baraat Horse Kissimmee, Baraat Horse Winter Garden, Baraat Horse Jacksonville, Baraat Horse Ormond Beach, Baraat Horse Winter Park Florida.